Everyone's favorite odd couple of cartoons step into the limelight for the first time! Join us for the crazy escapades of Ant and the relentless Aardvark in 'The Mad Lab' - the Aardvark thinks that he has the Ant trapped in the basement of a spooky, old house, but the tables will be turned on him when he finds that he's actually stumbled upon the laboratory of a mad scientist! And in 'Over and Under,' the Ant has found the perfect refuge from the hungry Aardvark- a military base surrounded by an electric fence. But modern technology won't stop a hungry Aardvark, who devises one scheme after another to get over and under that fence! 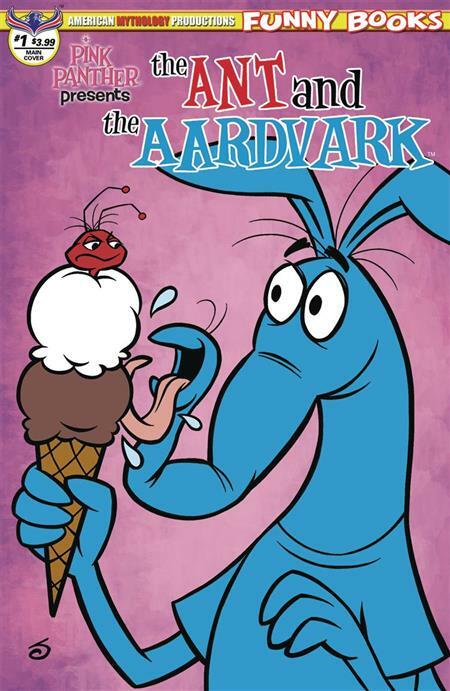 Pink Panther Presents: The Ant & The Aardvark #1 comes with three covers - Main Ant Flavored & Blue Hippy Covers by Jeff Scherer, and a Flashback Animation Limited Edition Cover!